In FRC the control system takes input (either from sensors or from human control) and translates that into output (movement). Think of it as the brains of your robot. 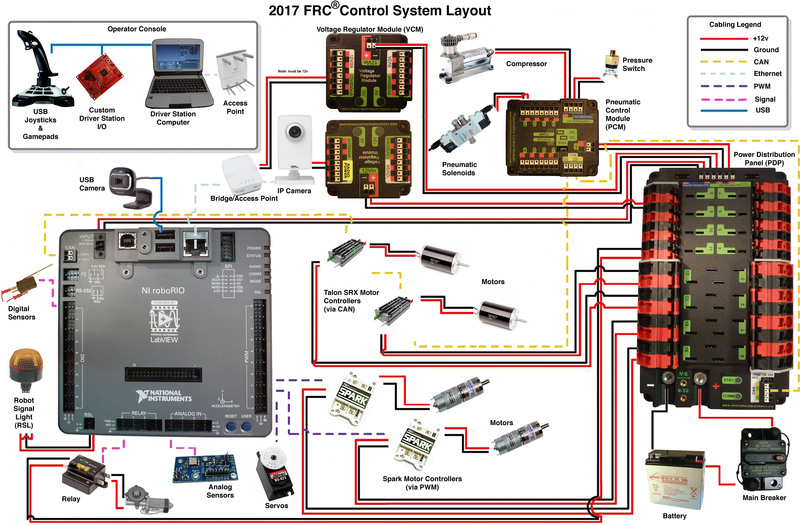 Directions on how to wire everything up: https://wpilib.screenstepslive.com/s/4485/m/13503/l/599673-wiring-the-2017-frc-control-system (note there will be 2018 versions released). Team 358 has produced a fantastic resource that goes into great detail about the different components. Spend the off season learning what the different parts are – you don’t want to make a mistake from lack of knowledge. Learning to wire proper connections is crucial – if a wire short circuits or comes out you are up the creek. Consider electricians putty and/or zip ties to hold the barrel of the wifi router in place. Look up the dimensions of the various components either on Andymark.com or through Solidworks (they have models for all the parts). Cut out paper in the sizes before hand so when you decide on a frame size you can manually position the parts to determine where you want them. Keep in mind that your battery is heavy – you can use this to set your centre of gravity. You also want it easily accessible so that you can quickly swap it out. Building a frame to lock it in place is really important. Space is at a premium – consider brackets to hold vertical sections of components. Decide on a standard set of connectors (and orientations) – can you wire in a new motor controller if something happens? Read the rules – make sure you use the correct wire gauge. Set standards and aim to minimize the different size gauges (and connectors) you use. Colour coding is important. Draw a diagram and use photos to document everything.